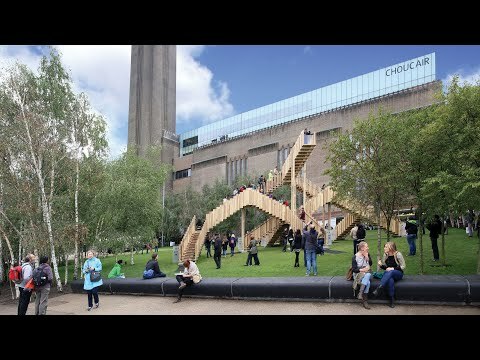 "Endless Stair" is a temporary stair structure which will be displayed at London's Tate Modern between September 13 and October 10, 2013. The sculpture was created from American tulipwood in an effort to engender interest in this type of timber in the European market. NUSSLI received the material from Italy, and was in charge of preliminary production. That included the cutting, grinding and milling of the raw timber as well as preparing the glue joints. The project team created a trial construction first to get a better idea of the integrity of the structure and to measure the static load-bearing capacity of the steps. The trial structure also offered the architect a unique opportunity to select the right type of stair railing. A number of options were installed and tested on the model until the architect decided on his final version. A total of 11.4 metric tons of timber were used in the final construction, creating an overall stair length of 436 meters. The staircase features 187 steps and is 7.7 meters high. The structure can support up to 90 people looking for the shortest way up on this "Endless Stair" at the same time.